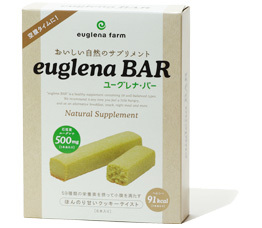 “Euglena bar” (Baked cake).Try to save both malnourished people and gluttonous people. 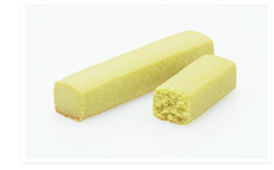 “When you do not have time to eat, you want to take nourishment easily.” Recently sweets which are equivalent to a light meal are popular in Japan. 1. You have no time to eat breakfast. 2. You need a midnight snack for overtime work. 3. You need children’s afternoon snack. 4. You supplement nutrition during exercise. This cake contains Ishigaki Euglena(Japanese name is Midorimushi) which has 59 kinds of nutrients. It attracts attention as a new ingredient for saving poor people in the world from malnutrition. I wrapped up the explanations in this homepage. It is an alga which is the same as seaweed and kombu. It contains nutrients that fish and vegetables contain. It contains 14 types of vitamins, nine types of minerals, 18 types of amino acids (including essential amino acids),unsaturated fatty acids such as DHA or EPA,GABA,Lutein,paramylon (an original ingredient) and so on. “Content volume” Six in one box. Please keep it in a cool place. Do not keep in a hot and humid place, and avoid to expose to direct sun light. Notes. Do your best, Euglena! Try to save both malnourished people and gluttonous people.